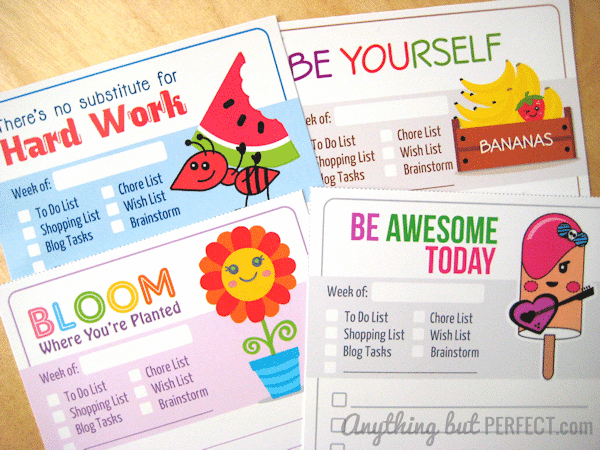 My to do list is so long, and I have gotten so professional about ignoring it, that I don't even think these adorable printable to do lists that Angela created could keep me from pretending like I am not supposed to be packing my house or planning an end of the year party at school. But, this summer when our schedule has slowed down and I am looking for a fun way to remind the kids of things they have to do each day so they don't sit around on the couch and forget everything they have learned at school, these cute printable to do lists will come in handy!! You can print out you own motivational to do lists over at Anything But Perfect.